Loerrach where my language school is and on this bench a question is written. At first glance this question seems pretty simple, innocent even, but within it can lie a very self-examination. 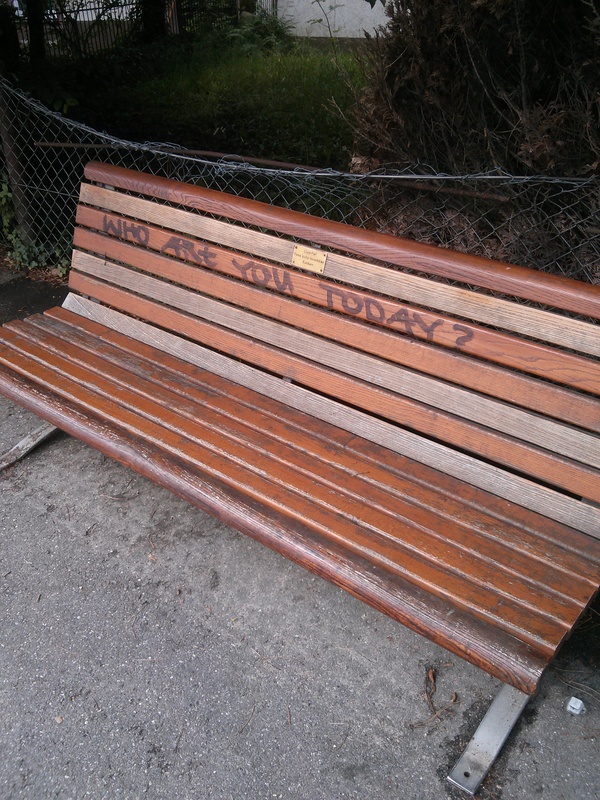 Someone scrawled (In English) “Who are you today?,” probably not thinking too much about how it would make people really look at themselves. If you think about it this question might never be answered. As Mark Buchanan suggests when he says, “We keep asking, though we never get a full or fully satisfying answer this side of heaven.” He goes on to talk about how who we have been, who are are today and who will will be all goes into the idea of who we are. We obviously cannot know the answer to this, since we don’t know what the future will hold. Who will you be? This is as crucial to your full identity as who you have been or have become. The future shapes you as much as the past or the present, maybe more. Destiny, every bit as much as history, determines identity. We can dwell on those things we regret or we can concentrate on living every moment for Him. Our past has no hold on us, but our future is limitless and matters more than what is in the past. That is a good question. Thank God, He allows U-turns. And once in awhile, we get 2nd opportunities to redo the ones we missed. Thank Goodness for 2nd opportunities. They can be especially valuable at times.